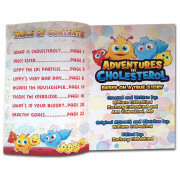 Join The Cholesterol Team on their adventures through your body! 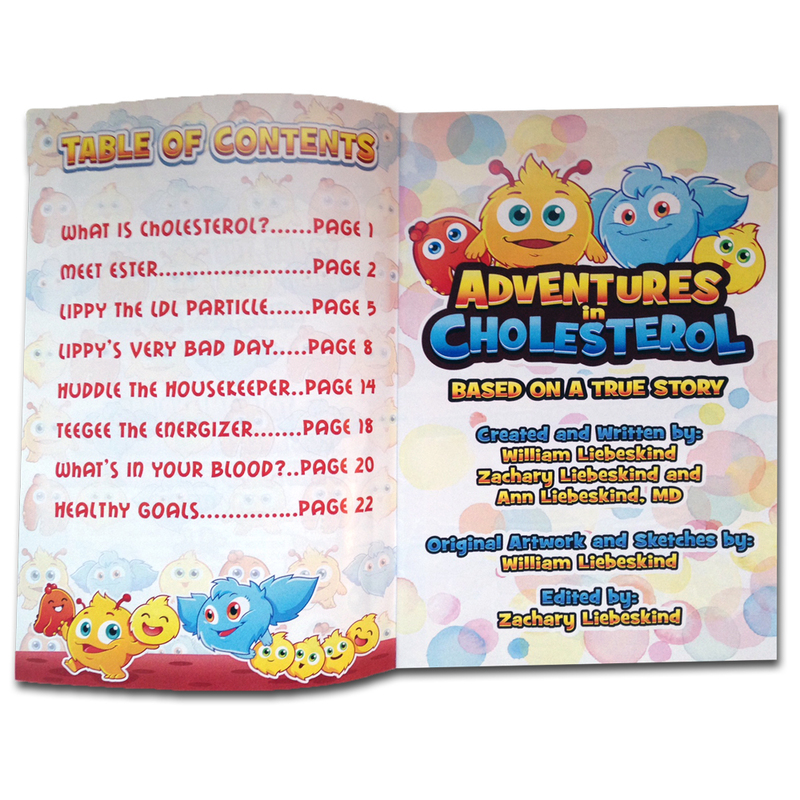 This educational, medically-accurate book, written specifically for kids and parents, teaches how cholesterol works in the body and how our decisions affect The Cholesterol Team – Lippy (LDL), Huddle (HDL), Tee Gee (Triglycerides), and the Esters (Little Balls of Fat). When kids and parents understand how their actions can improve or harm their health, it is easier for them to become more engaged and be successful on their journey to better health! Soft cover, 28 pages. Comic book style. 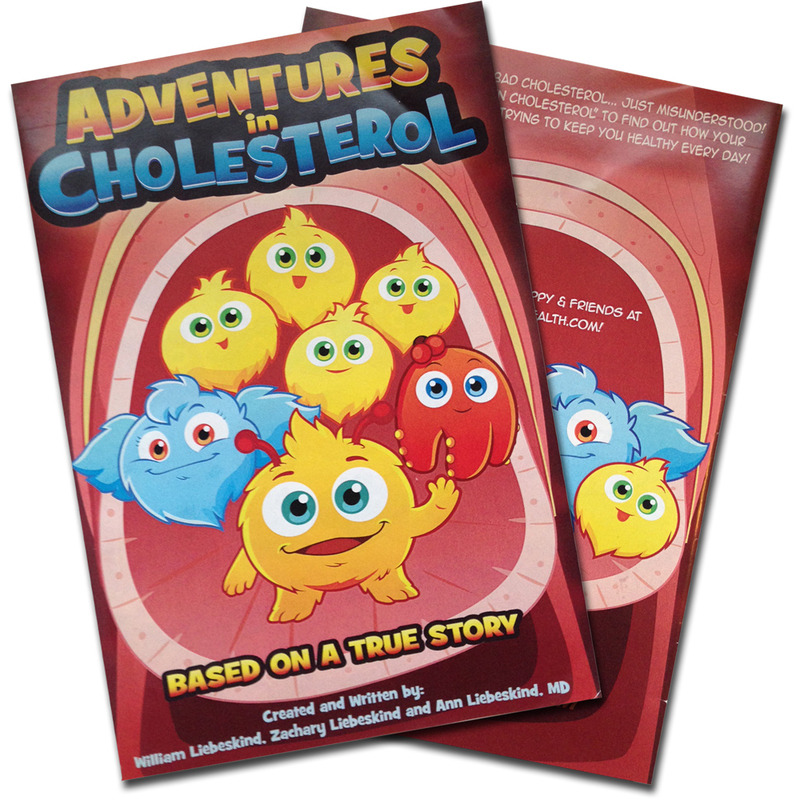 I read “Adventures in Cholesterol” with my kids, and it engaged them! The comic book style was just like any other book my 9-year-old and 11-year-old would pick up and read. My oldest child in high school even read it and liked how it presented concepts he’s learning in school. Adults can learn from this book, too. I never really understood what LDL, HDL and Triglycerides meant, but now I do! I also think this would be an excellent tool for health education classes, especially for middle schoolers. My boys, ages 11 and 12, loved reading “Adventures in Cholesterol.” They thought the cholesterol characters were super cool and helped them to understand how cholesterol works in the body. The graphics are fantastic and the content is appealing and engaging. One of their favorite parts was the 5 healthy tips list toward the end of the book. They are actually following the tips, which is remarkable. I highly recommend this book for parents, educators, doctors and truly anyone who cares about children’s health.